Kerr witnessed Ginobili’s rookie season in San Antonio firsthand, often marveling at the crafty left-hander from the Spurs bench. Sixteen seasons later, after Game 5 in Oakland, Kerr reflected on the most decorated Latino to lace them up. 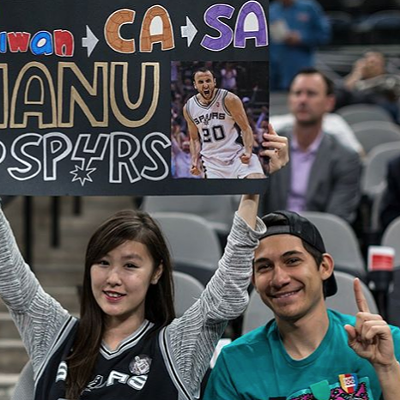 Like Tim Duncan before him, Ginobili retired on a Monday and sent Spurs fans into an emotional tailspin. Unlike Duncan, and true to his techie sensibilities, Ginobili made his announcement via Twitter. 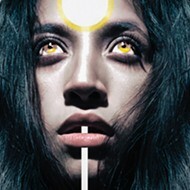 He followed up with a column in La Nación, one of the main newspapers in his native Argentina. “I really squeezed all the juice out of this whole basketball thing, right?” Ginobili wrote before acknowledging that he played the 2017-18 season knowing it was likely his last campaign. For those outside of San Antonio, Ginobili’s impact on the Spurs, the NBA, not to mention the game of basketball, can be hard to quantify. Although Duncan was clearly the catalyst for San Antonio’s quiet dynasty, Ginobili was the undoubtedly the straw that stirred the drink. Prior to Ginobili’s arrival, the Shaquille O’Neal- and Kobe Bryant-led Lakers dismissed the Spurs in consecutive playoff appearances. 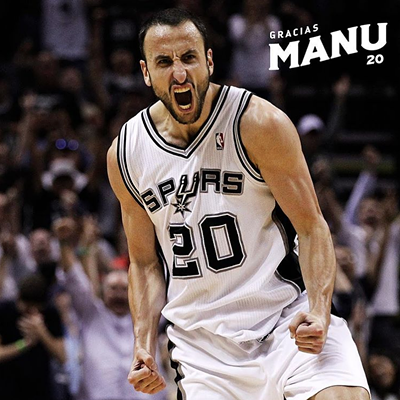 Even as a rookie, Manu provided unrelenting passion and infectious fearlessness in the postseason, helping to propel San Antonio over their hated rivals from Los Angeles en route to his first title. Bryant wept. Ginobili next set his sights on the Olympic stage, stunning Team USA in Athens to ultimately capture Olympic gold as a part of Argentina’s aptly named Golden Generation. During the 2004 semifinals victory over the U.S. squad, Ginobili singlehandedly outscored Duncan, Allen Iverson, LeBron James, Amar’e Stoudemire and Dwyane Wade. 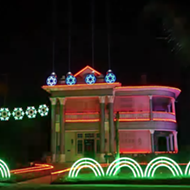 Additional NBA championships followed in 2007 and 2014, exalting Ginobili to icon status among San Antonio’s predominantly Latino fan base. 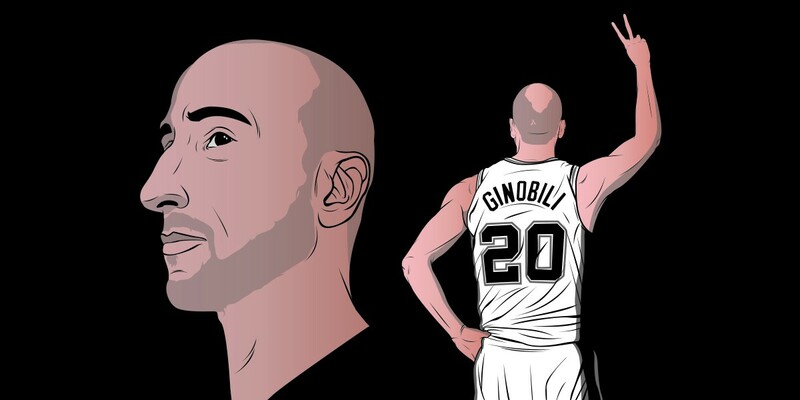 Many Spurs faithful found representation through Ginobili, a selfless figure who played with reckless abandon while unapologetically speaking their language. 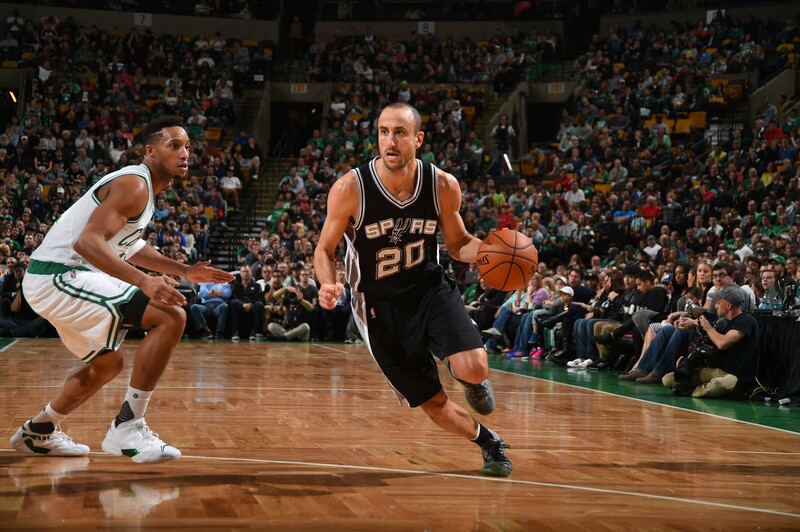 Spurs veteran Manu Ginobili in motion. 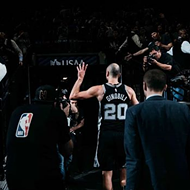 After a career more often defined by signature moments than statistics, Ginobili walks away from basketball with his legacy firmly intact. He joins Hall of Famer Bill Bradley as only the second player to win an NBA Championship, Olympic Gold, and a EuroLeague title. Ginobili and James are the only two players in NBA history with at least 3,000 points and 300 three-pointers in the postseason. It’s also worth noting that in the two seasons when Ginobili started 70-plus games, he was recognized as an NBA All-Star. Off the court, he was easily the most accessible Spur to both fans and basketball writers. He never succumbed to the adversarial tone athletes and their handlers often revert to when it comes to addressing media. 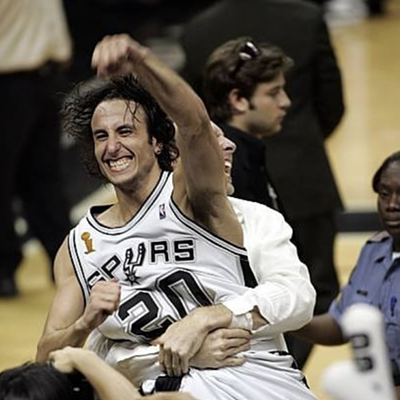 Throughout his Spurs career, Ginobili demonstrated an unflinching guile not typically associated with San Antonio basketball. He elevated the Euro-step into the NBA lexicon; turned impossible passes into regular occurrences; and more often than not, excelled in crunch time. 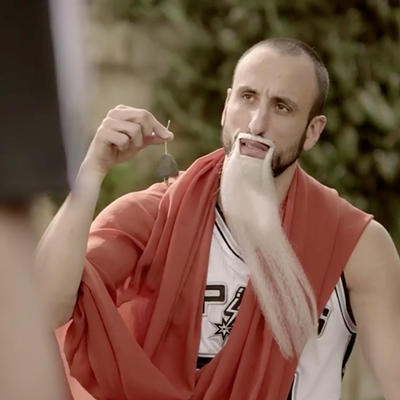 Ginobili’s own teammates were often transfixed by his kinetic flow. 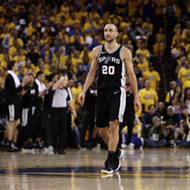 The total package was on full display in Ginobili’s last home game, an exhilarating 103-90 win over Kerr’s Warriors in Game 4. He turned back the clock one last time to score 10 of his 16 points in the fourth quarter and extend the series against the defending champions. 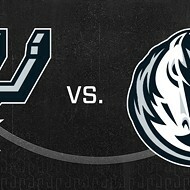 Despite his heroics, Ginobili fittingly deferred to his teammates in his last on-court interview at the AT&T Center. Over the summer, Ginobili shared several photos of his family’s vacation in Canada via social media. There’s Ginobili with young sons Dante, Nico and Luca hiking through the wilderness in Vancouver. Here’s Ginobili taking a birthday selfie with wife Marianela, a sparkling lake and picturesque mountain range serving as the perfect backdrop. There’s Ginobili standing on top of the world at the Whistler Mountain Peak Suspension Bridge in British Columbia. Any father with a young family would marvel at these photos and likely surmise where Ginobili’s decision was headed. In perhaps the most dysfunctional off-season in franchise history, the Spurs bid farewell to Parker, Kyle Anderson, Danny Green, Kawhi Leonard and now Ginobili. With new additions DeMar DeRozan and Lonnie Walker IV joining the roster, and defensive stalwart DeJounte Murray still in the fold, the changing of the guard in San Antonio, although tinged with melancholy, represents a fresh start in a rugged Western Conference. As many Spurs enthusiasts can attest, San Antonio climbed the NBA mountain through a strong tradition of skilled big men. Ginobili represented a basketball anomaly who, along with Parker, shifted the Spurs narrative toward the backcourt and the Beautiful Game. 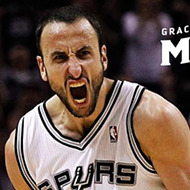 As Coach Popovich reminded us just last summer, Ginobili was our Bryant, our Jordan, our Magic and Bird. 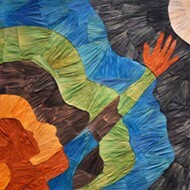 Championships are forever, yet sometimes their luster obscures the beauty in the struggle. 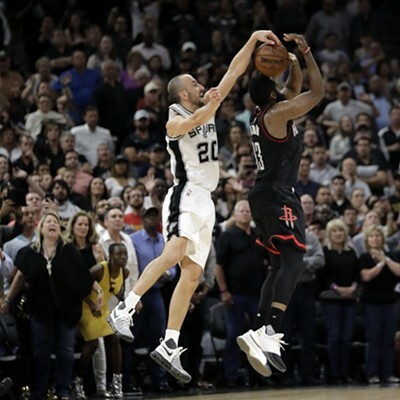 This was never the case with Ginobili, who thrived on competition, redefined the role of a sixth man and, in the final contest before his serenading fans, went out in old gunslinger fashion, shooting against the champs.